The party having fled the above floor after their first costly encounter with the swords defenders, slowly began to gather themselves once more into some semblance of order. Then only moments after reaching the first floor a large explosion was heard and due to the impact force of it, they were quickly joined by Cor as he fell to lay unconscious beside them. �Where is Maggot and Sirene?" The question of Sirene was easily answered as the Elvin enchantress glided to a landing close to her just as her spell of Improved Invisibility expired. She as Cor looked ragged from the large explosion above and upon landing she did as Rayne had done and cast Cure Moderate Wounds on herself. While this was taking place the cramping and pain had become too much for Haila, who fell to her knee�s barely managing to speak, the poison dangerously close to killing her. Haila "The poison is now running deep into my veins, please does anyone have a cure poison? I have a couple potions of extra healing should anyone need anything." With Cor out of commission for the first few minutes and Haila on the verge of death, Ulthok stepped in to give each surviving member something to do. With that, suggestion voiced the healers healed, Cor was revived to once more assume command, Haila was cured of the poison killing her, and Rayne was told of Maggot�s death. It was here that Cor proceeding to brush the dirt and grime from his clothes & armor came upon a gruesome, though heartening discovery. A human looking right hand, thumb and pinkie slightly chewed, its middle finger extended, the hand ragged and torn as if eaten but not yet swallowed was lodged between his armor and tunic. A quick check of the survivors showing each to have all of theirs, Cor concluded correctly, that thanks to the explosion of gas and fire that this piece of Maggot had somehow landed upon him and been lodged within his clothing to fall with him to this floor. As Cor showed the rest what he had found it became clear to all if not for the explosion no remains of Maggot would there have been to find by the time the party reentered the upper floor, and the Ranger/Bard would have been gone forever. Now with the remains of his hand Cor could at least attempt to resurrect the crazy old Half-Elf. Holding the hand close Cor spoke to the party before him. �Anyone have any ideas? Perhaps retry the cloudkill without the fire elemental? None of the creatures actually attacked Althena. Perhaps the non-detection spell worked. It was only because of the fire elemental the creatures attacked. Should we have her try alone? The answer to my augury was a bit vague because it did not really answer what would happen to her alone as Odin saw the spells would occur before that attempt." (DM OOC: Ok here�s my delayed post, next post Jan 8th 2012. Ok Spellcasters check your sheets to see what spells have been used and may need to be replaced. On a side note please see my post in the Q/A. Posted on 2011-12-20 at 05:23:17. Cor began to clean the dirt and grime accumulated during the explosion and his subsequent meeting with the wall and stairs from his armor. Amidst the expexted dirt he found a most unexpected item. At first he was not sure what it was but closer examination revealed it to be a well ccharred human hand. "By Odin's beard, I do believe Maggot has found a way to lend us a hand." Cor laughed at bit. "Seems the blast may have just saved him from permenant death. I do believe that even with such a small piece I can resurrect the poor lad. Might be a bit tough and he might well not survive the attempt but at least he has a chance. Let me see about getting the lad back while the rest of you ponder the beasties above. Something has to hurt them." Cor began preparartions for his spell and after a quick prayer to Odin he cast his resurrection spell. Posted on 2011-12-21 at 19:46:36. Kenji listened as the others talked about strategy and spells to use and he thought himself of what had happened above and what he had observed. He was quite for awhile and then raised an eyebrow at something that occurred to him. Could it be? Posted on 2011-12-24 at 02:59:19. "Well now laddie, tis a fine idea. It may nae work but then again neither has anything we have tried. Let's take a wee look at that room full of weapons and armor. Lead the way." Posted on 2011-12-24 at 13:07:02. Ulthok listened to the usually quiet warrior. "Great Googgily Mooggily I think you've hit on sometime. It would simple enough to test. Sneek up the stair and hurling a spear at of one them nasties. If it sticks then we know! Quick I'll show where they are and you can give them a taste of natural iron." The theif side to Ulthok nearly bubbled to think that his earlier seach might not had been a failure. Posted on 2011-12-24 at 17:11:00. Taking an armful and asking the other two to do the same, he carried all that he could back to the where the others rested and recovered at the base of the stairwell leading up. Looking through the weapons, the Samurai picks out a long and short sword which most closely feel similar to his natural swords. He takes off his swords and sets them with his other gear which he leaves there at the base of the stairs. Tucking the new swords in his belt he hefts a spear and tests it�s weight. Kenji in his usual fashion did not attempt to take any credit for this idea; he didn�t seek any praise for this even if it worked, he only wanted to be of use and he hoped they would succeed. He waited to see if they would agree to him trying, or if someone else would be more suited to the task. Posted on 2011-12-24 at 17:39:25. "I believe that it would be best to use a ranged weapon first; arrows if we can find any and spears if not. Even a thrown dagger would suffice. If that causes then wee beasties a pause then we can close for combat. Perhaps two can go and test the theory while we see if Maggot will come around after the resurection." Posted on 2011-12-24 at 21:54:39. The three returned to the party with the weapons, battle & hand axes, long & short swords, a spear or three, a lance, a pair of javelins, some daggers & throwing knives and some arrow tips too. The weapons were laid out so the others could take thier pick. "Find what suits you best! Who will be the one to test this idea, Kenji? If it works I still think a dimensional door to the stand would get the Lady Althena her chance to claim the sword. Also let us fresh our spells that may help and guard us. Let us think if we have missed something, in our haste and with this pressing evil it may have fogged our reasoning. Question yourselves, now is the time to reach deep to your training and abilities. The unasked question may be to one that holds our fate." With that Ulthok turned to the party leader," Cor is there anything I may help you with to restore our friend Maggot, I hate seeing him gone to pieces like that?" As he waited for Cor's reply the Mage pulled his Tome of Magic from it secure place and began preparing new spells that may serve them better. Posted on 2011-12-26 at 21:27:45. "Well if I resurrect Maggot now I will be unable to do anything for nigh on a month. Might not be the best plan down here. Everyone find a weapon that looks good to you and we will head up the stairs. First attack will be with the javalins and if they do damage then we rush the vile beasties. We need to focus on one at a time as a group to drop their numbers as quick as we can. i donna want to have more of ya waiting to raised. Fear naught about the lad, I can bring him back anytime in the next 100 plus years." Cor looked through the weapons and took up an axe and readied for the coming battle. Posted on 2011-12-26 at 21:54:06. Kenji listened to their leader and nodded and gave an affirmative Grunt. He had already claimed a long and short sword that seemed close to his own pair of blades. He left his with his back pack and other items at the base of the stairs. Hearing Ulthok talk of spells again he turned to the halfling and voiced his concerns once again, "I fear if you use this door spell of yours it could mean trouble. I do not like the idea of the Lady Althena being so distant from the group. No offense to you my little friend, but who knows what awaits at the pedestal of the sword if that is indeed te source of the light. It could be be a trap and you could find the both of you possibly dead." When the others were ready he hefted the spear he had and headed up the stairs at the head of the group. Cresting the top, he would wait till the order was given or the beasties charged them. He would cast the spear as hard as he could at the nearest creature and then draw his swords and rush forth using his speed to engage the same creature. Posted on 2011-12-27 at 01:56:27. Ulthok was ready to reinforce his spells when Cor piped up. �Everyone find a weapon that looks good to you and we will head up the stairs. First attack will be with the javalins and if they do damage then we rush the vile beasties. We need to focus on one at a time as a group to drop their numbers as quick as we can. Then Kenji voiced his fears, "I fear if you use this door spell of yours it could mean trouble. I do not like the idea of the Lady Althena being so distant from the group. No offense to you my little friend, but who knows what awaits at the pedestal of the sword if that is indeed te source of the light. It could be be a trap and you could find the both of you possibly dead." �Allll..righty then�., I�ll just grab some natural iron and back you up friend. � Ulthok put his Tome safely away and eyed the weapons laid out. Spying a right sized short sword he mimicked the moves the Samurai as he tested the balance of the weapon. It felt good and moved smoothly; finishing the routine he slid the blade into his belt. But before walking away he also grabbed up a couple throwing knives, placing them in the hidden places he had for such weapons. Then as an afterthought he scooped up three dozen of the iron arrow tips. As the others selected their weapons the mage pull his sheaf arrows from pack started replacing their tips with the iron from the temple armory. �No sense getting any closer than necessary.� The mage knew that arrows had worked well in their last battle and he hoped these would work as well now. Moving to the foot of the stairs Ulthok takes out his bow and notched an arrow. Smiling up at the Samurai Ulthok willed a touch of spirit into his ring and vanished. Posted on 2012-01-03 at 03:15:26. With the party safe and fully healed once more the reality of what they faced above sank in for the first time. Though it was clear they faced a group of 10 giant mutated insects, nothing they had done from magical spells to magical weapons had thus far worked leaving one party member dead and all wounded. As the talk progressed from using more magic of a higher level to teleporting close to the light to the resurrection of Maggot and the time involved it was a simple fighter that came up with the best plan, though a risky one. Tomiki Kenji had since the party entered this mountain felt vastly out of his depth as all but he were multi-trained in two or more professions be they a caster of magic, a healer or a master of locks and stealth. Yet he as the lone single classed fighter had been for the most part, at least in his mind, useless. Though Cynil also was of only one trade her abilities allowed her to heal and cast magic and she was more of an aid then he, it had all been quite frustrating to say the least. Mayhap however it was that single minded training as a Samurai that brought forward a possibly revelations, Could it be? "Well now laddie, tis a fine idea. It may nae work but then again neither has anything we have tried. Let's take a wee look at that room full of weapons. Lead the way." �I suggest we use no magic then until we try this first,� Kenji said to all and then turned to Ulthok, to lead them to the room he had scouted earlier. "Great Googgily Mooggily I think you've hit on sometime. It would simple enough to test. Sneak up the stair and hurling a spear at of one them nasties. If it sticks then we know! Quick I'll show where they are and you can give them a taste of natural iron." In no time at all the party were armed in their choice of non-magical weapons appropriate to their skills and had gathered once more at the staircases base. Kenji having armed himself with a long and short sword now gathered to him the two javelins and a single spear. Hefting the spear and testing its weight, he turned to Cor and Ulthok. "I believe that it would be best to use a ranged weapon first; arrows if we can find any and spears if not. Even a thrown dagger would suffice. If that causes then wee beasties a pause then we can close for combat. Perhaps two can go and test the theory while we see if Maggot will come around after the resurrection." With Cor�s words of a plan decided Kenji in the lead followed by the rest of the party made his way up the stairs to stand just below the raised second floor and surveyed the scene before him. Seeing the creatures seemed to take no notice of him and were even not watching the stair entrance he zeroed in on the closet Roach/Scorpion and hefted the first javelin towards it. As he had said below on his skills with spear�s and javelins so it was evident as the javelin easily missed flying by the mutated creatures head. However it did not go unnoticed as the creature turned towards the stair and charged, the second javelin to hand Kenji once more threw as the rest of the creatures turned towards him. Again, the second javelin missed as the creature had become a moving target, followed by the other eight. Bringing up the spear to throw a chill of warning suddenly hit him as he realized that only nine of the ten creatures was charging towards him�, where was the tenth. Spinning quickly he found said tenth creature about to wrap it�s mandibles around him as had happened to Maggot!! The spear thrust hard out forward he was overjoyed as the tip pierced the mouth of the creature spraying a thick brownish liquid everywhere and sending it skittering backward in pain. The spear for the moment lodged in its mouth was a clear indication that the member of the party who thought himself the most useless was rather in this instance the most important. 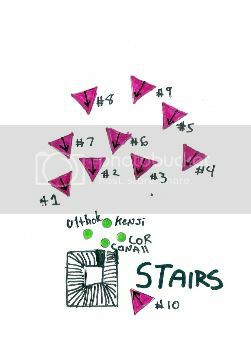 (DM OOC: Ok there�s my post for this week and yeah it�s early, but gives you more time to decide your order of battle as I will post actions for each player not by initiative this time but by placement on the stairs. Posted on 2012-01-05 at 03:22:45. Cor watched as Kenji's two javalins sailed wide. He had hoped for at least one hit. It was as the warrior was about to cast his spear that one of the creatures suddenly appeared and made an attempt to cut the warrior in two. As luck would have it, Kenji was faster and his iron spear did damage where magic ones had not. "Aye lad. the normal weapons work! Forward everyone and remember to kill one creature before trying to get to another." Cor said a silent prayer of thanks to Odin that the plan seemed to be working. Posted on 2012-01-05 at 04:12:01. Kenji had cursed slightly under his breath as each javelin had gone wide; these were not his weapon of choice by far. He had readied the spear to throw when he noticed that one of the beasties was missing; his acute battle senses were such that he could not be surprised and they warned him in time to turn and see the missing bug ready to bite down on him. Thrusting out the spear he grunted as it lodged deep in the things mouth and stuck there. He gave it a final shove as the thing backed up in pain; yes it appeared these things could be hurt. Kenji whipped out the two swords he had selected, a long and short one as close to the balance and length as he could to his usual weapons. Hefting them he opened his throat and gave a mighty battle cry; no longer did he feel useless. Here was a foe he could battle now, and he would kill as many as he could or die trying. He went after the one with the spear in it�s throat since it was wounded and the closest to the stairs from where the other companions would be attacking. He lashed out with two swords, short and long, using all his strength behind each swing. He might not live beyond this day, but any survivors would surely remember how he died; battling ferociously! Posted on 2012-01-07 at 16:48:54. Conall reluctantly sheathed his Holy Avenger. He never fathomed that he would ever be lucky enough to possess one... Nor did he think that should he possess one, he would pass it up for another blade, let alone one that was non magical. However, seeing as how the previous encounter had ended so poorly, Conall had no choice but to place his trust in his friend and fellow combatant Kenji. He truly hoped that this plan would work, for there was very little else the Conall could think of that would be useful in the slightest. Kenji, being ever the brave soul, was the one who led the pack forward. He carried two javelins and a spear, and as he headed forward, Conall went over to the pile which had been carried in by Kenji and Ulthok, and sifted through the pile. Finding what had seemed to be a fairly sturdy looking longsword, Conall grabbed it, and did a couple practice swings, getting a feel for the weight of the blade. It seemed clunky, and unwieldily, the blade at his hip calling out for him. Conall sighed, and took a few more swings. He turned to face the fray once more. The others were already ascending the staircase, and so Conall rushed up to join them, not wanting to be the last to join the fray. Hearing a yelp that sounded like Kenji, then a cry that sounded like something else, Conall couldn't help but smile. Kenji had figured it out. This was the answer. The new question though, was how difficult would these creatures be to beat with non magical weapons? And no magic period. How would their armour stand up? These thoughts flooded Conall's head as he waded in to battle, eager to vanquish this evil once and for all. Posted on 2012-01-09 at 20:19:47.